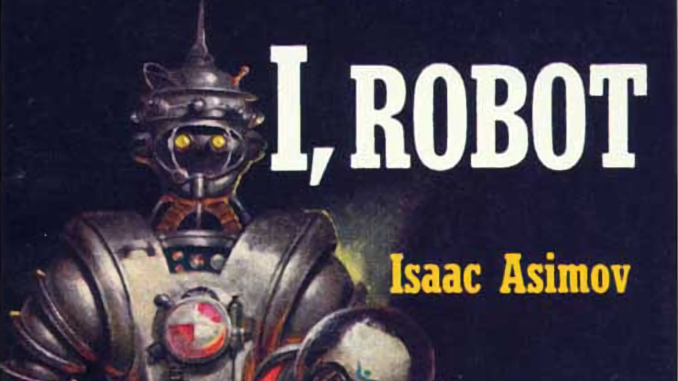 I, Robot, a short story collection by Isaac Asimov, is most famous for coining The Three Laws of robotics. Throughout the ten loosely connected stories in this volume, some of the possible consequences of these laws are explored. Most of the stories involve an aspect of the laws getting the main characters into trouble, with them finding a clever use of said laws to solve their particular problem. The book is built around the framing story of Susan Calvin telling about her life as a robopsychologist. This makes Robbie, the first story in the collection, somewhat of an odd one, as it is almost completely self contained and none of the central characters from it ever show up again in the rest of the novel. Indeed, you could easily read Robbie on its own and get a complete narrative, while never touching the rest of the book. Robbie starts with a young girl, Gloria, playing hide and seek with her robot companion, a tender scene that establishes their close relationship. But her mother really doesn’t like how Gloria spends time only with Robbie, without making any other friends, while her father doesn’t see any issue with how close they’ve gotten. Eventually, the mother convinces him to get rid of Robbie, and when Gloria discovers that Robbie has “run away”, she is very upset by the loss of her only friend. This was easily the highlight of the volume for me; though part of this is because I’ve had close friends move away when I was younger, making this story somewhat personal to me. Though it really is simply the best story of I, Robot; the later ones just don’t have the emotional weight behind them, so they’re not as interesting to read. Even the clever twist at the climax of the story was more interesting than those in most of the others (though I won’t spoil it.) Susan Calvin makes a very brief appearance as a background character in the story, and it feels really shoehorned in—like she was edited in after the story was written just to connect it with the others. This brings us to the stories of Powell and Donovan, who are the two most boring characters in the entire book. They are two engineers who are shown at various stages of their careers throughout I, Robot, and their only differentiating characteristics is that one of them has curly red hair and the other has a mustache, though I cannot remember which one had which without looking it up. I understand that this is more a book about exploring ideas than it is about the nature of the human/robot condition, but those two are so boring that I couldn’t bring myself to care during the times when their lives were in dangers, making their stories somewhat of a slog to read through. Pretty much every story about Powell and Donovan follows the same pattern: As they’re working with a new type of robot, one or more of the Three Laws hinders their ability to perform their job while also putting their lives in mortal danger, so they have to come up with a clever trick to get out of the mess they found themselves in. Sure, there are some interesting ideas, like the robot that invents its own religion to explain its existence when it doesn’t believe Powell and Donovan, but those ideas themselves don’t make for an interesting story. Thankfully, Susan Calvin and Stephen Byerly, the other central characters of the collection, are much more interesting. The first story that’s actually about Susan is Liar!, which is about a robot that cannot say even the most mind negative criticism about a person because that would be a violation of the First Law. The robot convinces Susan that one of her male coworkers has a romantic attraction to her; this causes her to begin making advances toward him that he never reciprocates. Throughout this scene and in the one that follows it, Susan is really awkward and embarrassing in ways that really aren’t endearing. Sure, she’s a character who is fairly interesting to read about, but she isn’t really someone whom I would ever wish to spend time with. She really isn’t as compelling to me as other female Sci Fi characters, such as Aki Shiraishi from Ursurper of the Sun. What is interesting about Susan is her occupation as a robopsychologist—an expert in the the field of psychology as it relates to robots. This gives her a unique perspective when dealing with the problems that arise due to the alien nature of the robot mind. Her specialized knowledge is often key to solving the various challenges that cross her path throughout the book. Stephen Byerly is introduced toward the end of the book in the story Evidence, where he runs for mayor. However, his political opponent, Francis Quinn, believes that Stephen is a robot pretending to be a human being. The conflict between Francis and Stephen makes for a very entertaining read, as Francis tries to prove that Stephen is in fact a robot by forcing him to break one of the Three Laws. Stephen is also the central character in the final story of I, Robot, The Evitable Conflict, and it was really kind of a let down for me. Most of the story involves Stephen Byerly speaking with various Regional Co-ordinators without any interesting dialogue or conflict happening during their discussions. So by the time the story reaches it’s conclusion, the shock of the big, scary twist wasn’t very effective. This story is what really made I, Robot somewhat of a let down for me. I can kind of forgive the Powell and Donovan stories for being a little dull because the ideas involved are interesting enough, and the book picks up after Susan Calvin gets involved. But having such an uninteresting story right at the very end of this collection really left a bitter taste after I finished reading the book. So overall, I, Robot was rather disappointing for me. I liked a couple of the stories in it, but the rest varied from merely okay to dreadful. I’m still interested in reading Isaac Asimov’s other Robot books, but getting my hands on them won’t be that high a priority for me. Thanks for the review. I, Robot might just be the archetypal Men with Screwdrivers story. Glad to hear your enjoyed it. This collection was my favorite out of all the Asimov I’ve read and tried to read. Azzy: the God-Emperor of every nerd who ever brandished a sliderule or screwdriver in anger. There’s something almost touching about how he kept trying to engineer bloodless, bland futures where the geeks would inherit the babes and coolness. You mean we get to blame Asimov for these “1 Clever Trick” click-bait ads? Ok! Asimov’s concepts are pretty good; his characterizations and dialog are … less than compelling. To be generous.